Quietly located in Berlin’s leafy district of Treptow-Köpenick, this hotel offers air-conditioned rooms and a garden terrace. It is just 600 metres from the Müggelsee Lake in Friedrichshagen. 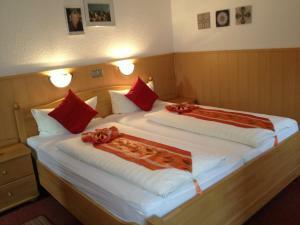 All rooms at Hotel Bölsche 126 are brightly decorated and feature a TV as well as a desk. They also include a private bathroom with a hairdryer. A hearty breakfast buffet is served daily at Hotel Bölsche, and in the evenings guests can enjoy a drink at the bar. Various restaurants and cafes are within a 1-minute walk of the hotel. Bicycles can be rented from the hotel to explore the area, while the Müggelsee is a popular lake for swimming. The centre of Berlin is 18 km from Hotel Bölsche 126. Providing connections to central Berlin, Friedrichshagen Train Station is 800 metres from Hotel Bölsche. Schönefeld Airport is 15 km away, and the A10 motorway is a 15-minute drive.